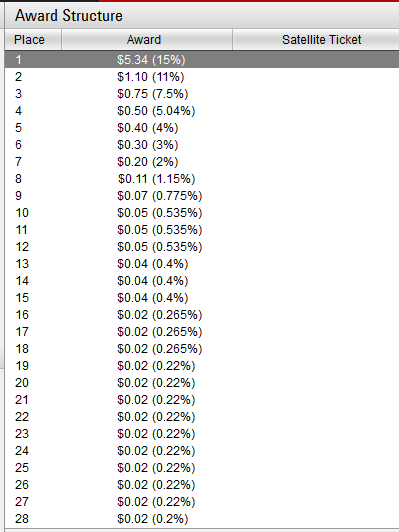 Is PokerStars "The League - Elementary $10 Added" Freeroll a joke? Do you think this tournament is a joke? As result of this ridiculous values, they end up paying just 90 places. Place 90 is the first one that in reality should get 1,14 cents. But Pokerstars just round this at 1 cent. What happens with the remainder 0,14 cents? Well, they go adding to the first place prices. And it ends up looking something like this. I just don't understand what's the point of this tournament. I know (or at least I think) nobody forces Pokerstars to run this freerolls. 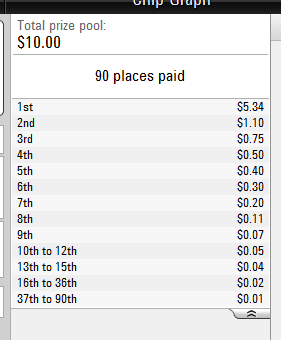 But $10 as a prizepool on a tournament where about 7000 player entry to play it... To me sounds like a joke. It would be better for them to cancel this ridiculous tournament, or increase the prizepool, or do something different, don't know what. But to me, looks like a joke. Similar Threads for: Is PokerStars "The League - Elementary $10 Added" Freeroll a joke? to answer one of your question, i think it's a bug or something. they always pay 90 players, but for some reason it shows it pays more players when the tournament is in registration mode and haven't started yet. I just don't understand what's the point of this tournament. In this tournament, the size of the prize pool is of secondary importance. re: Poker & Is PokerStars "The League - Elementary $10 Added" Freeroll a joke? on 888 I enter the 200$, when it switches the pay out from ... to 3085 players, and 1099 are paid, although there are 993 players left. Where does all that money go? Higher financial calculations they do on professional sites to print money? I guess! But the league is only to reemplace daniel in 5 years, don't you worry. Honestly pokerstars has a long way to catch up with 888 poker when it comes to freerolls. Pokerstars is very stingy on freerolls and 888 poker is very generous when it comes to freerolls. The school League has 4 levels. And in each you can win money on the results of your games for the month and directly in the game. This tournament is part of the monthly league where you earn points and at the end of the month top 500 players get prizes. This cash prize is very small for such a tournament, but this ELEMENTARY LEAGUE tournament is very good to collect points and qualify in the league above and get good prizes at the end of the month! But 7000 people do play so why should PS stop them ? Could it be the 7000 people have a good reason to play? Well... why do You think it is called "The League" ??? But the first 15% in these tourneys get points for the League Leaderboard. This leaderboard pays out prizes at the end of the month. can win get bigger on each level. The best players from the "Elementary" leaderboard qualify for a hiugher level in the next month. So You can move up the levels and win big prizes if You make it to the Masters Level. I do not think it is a joke because if you are able to win a tournament of 10.000 players you are able to win any tournament agree? Its score based not money. When you get to a certain place you earn a certain amount of points. At the end of the month if you are im the top i dont know how many players, you advance to a higher tournaments. And also its good for true begginers to practice. I personally love it. It kinda gives me some experience at a real money tournament without having to actually add money to your account. Ahhh thanks you. I was missing that. Didn't know. Thanks for the info. I am playing on University level. I play every evening and think it is fun. By the way, does someone know about such format of freeroll games as League at the other poker rooms? Be serious, no one would play a tournament that lasts more then hour for 1 cent. Its score based not money. pokerstars doesn't need to offer freerolls as the amount of players they have on their site makes even a $1.10 tournament worth playing. also on 888 (and i'm not saying that its rigged) it seems like a site designed for gamblers there are what seems like an inordinate amount of flops that connect with 3 or 4 players so that these players will put their chips in just to see the river card turn over a 1 or 2 outer that completely changes the result of the flop. like i said not saying it is rigged i think that is the way their engine works and also this makes TAG play on 888 impossible because all their regulars understand the way it works and never fold any sort of cards with some sort of co-ordination. also a very high amount of flops seen with 4 of a straight (5689, TJKA or 6789/789T) not these exact numbers but that sort of layout.